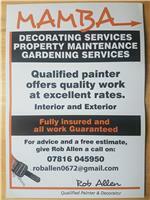 Mamba Painting and Decorating Services - Painter/Decorator based in St. Leonards-on-Sea, East Sussex. Hello my name is Rob. I did a 3-year apprenticeship with James Longley starting in 1988. They were one of the largest building companies throughout the south of England with new builds and renovations, with over 50 sites. My father had his own building company and I worked alongside him for many years doing all aspects of property maintenance and landscaping on private and commercial property. Now working as a sole trader, I specialise in commercial work. I am very highly experienced and offer excellent rates. Please feel free to get in contact with me.